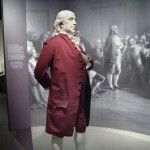 A three-piece silk suit Benjamin Franklin wore in 1778 while serving as the United States of America’s first ambassador to France has been purchased by the Smithsonian’s National Museum of American History. The iconic garment had been on loan to the museum from the Massachusetts Historical Society in Boston since the 1970s for conservation and research, but its fragility only allowed it to go on display three times: in 1974, in 2006 at an exhibit in honor of Benjamin Franklin’s 300th birthday, and in April of this year for the American Stories exhibit. Recognizing the long-term preservation needs of the garment that it could not fulfill, the Boston society has now allowed the Smithsonian to purchase the suit. It must have been hard for the MHS to let it go after so many years. It was donated to the Massachusetts Historical Society by Elkanah Watson in 1803, just 22 years after he received it as a gift from Benjamin Franklin himself. As a young man, Elkanah Watson was apprenticed to merchant, slave trader and committed Federalist John Brown, co-founder of what would later be named Brown University in honor of him and his brothers. In 1779, Brown and some other Revolutionary leaders asked the 21-year-old Watson to carry some dispatches to Benjamin Franklin in France. Elkanah, dissatisfied with what he’d seen of the merchant gig and yearning to see more of the world, gladly took the assignment. He continued to act as courier between the nascent United States and its delegation in France for several years. On one of those trips he met Mrs. Patience Lovell Wright, an eccentric widow who supported her family after her husband’s death by turning her hobby of sculpting faces in bread dough and wax into a wildly successful profession. So successful was she that she moved to England and sculpted the likes of the King and Queen — whom she called George and Charlotte — as well as William Pitt and Admiral Richard Howe. She also spied on them all in support of the Revolutionary cause. Legend has it that she would make wax heads of Patriots, then hide them under her apron when a Royalist came to her studio. Legend also has it that she would hide spy notes inside the wax heads, then ship them back to the States. 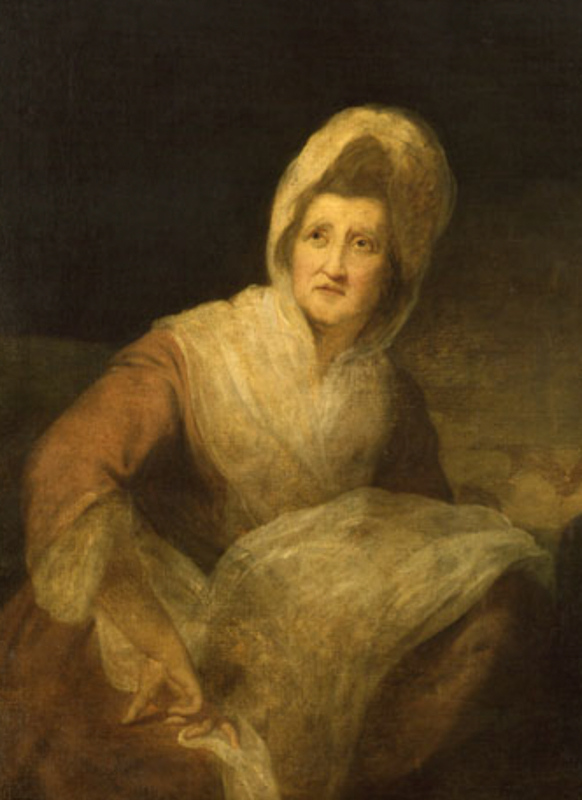 During 1775 and 1776, she was one of Franklin’s best sources of intelligence about what the British were planning. In 1781 Watson commissioned Mrs. Wright to make a wax sculpture of Benjamin Franklin’s head. When the work was done, Franklin invited them both to dinner at Passy. Here’s the passage describing the events from Elkanah’s memoirs. This may certify that in the year 1781, being at Paris, in France, the celebrated Mrs. Wright executed for me an excellent likeness in wax of the immortal Dr. Benjamin Franklin. Dining with her at the Doctor’s, in Passy, and on comparing the heads, I suggested that such a head deserved a suit of his own clothes, on which he rang for his servant, directing him to bring the suit he wore…in the year of the signing of the famous Treaty of Alliance between France and America, in February, 1778. 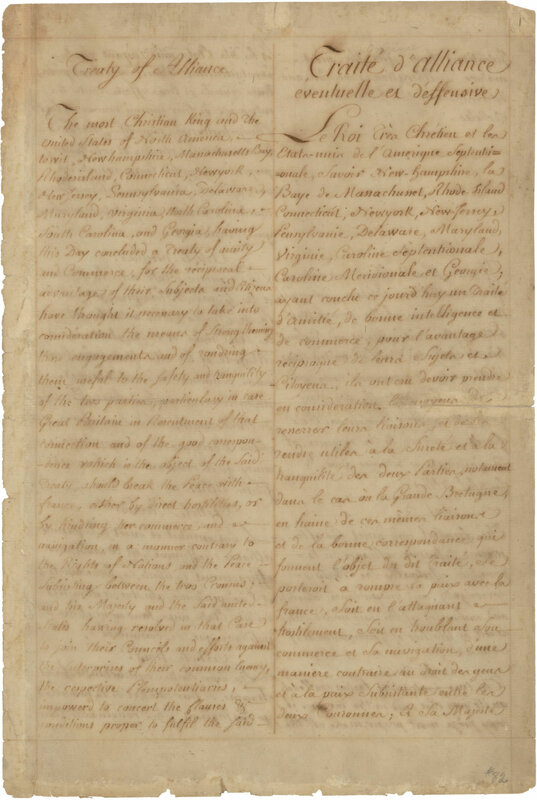 Watson then wrote a follow-up emphasizing that the clothes were from the year Franklin signed the treaty, not the precise time he signed the treaty. This doesn’t in any way decrease the historical importance of the suit. Franklin’s clothes played a massive role in the ginger diplomatic balancing act he had to do to secure the vital support of France for the baby United States. 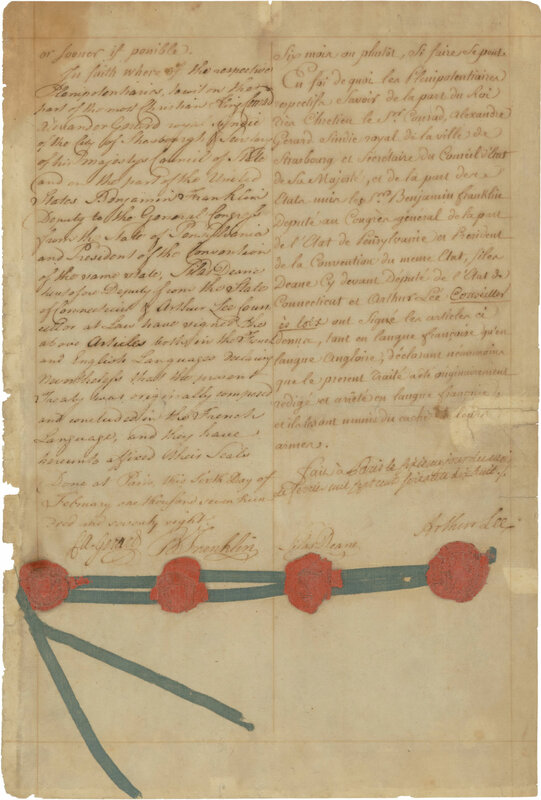 The Treaty of Amity and Commerce and the Treaty of Alliance, both signed on the same day, ensured that the raggedy new country would have economic and military support from one global superpower in its war against the other. Without France’s contribution of money, weapons and supplies, the American Revolution would have had a very different outcome. Franklin’s “ditto” suits, so called because they were all designed in the same simple style out of the same silk, projected an image of America as virtuous, plain, hard-working, frugal and sober. 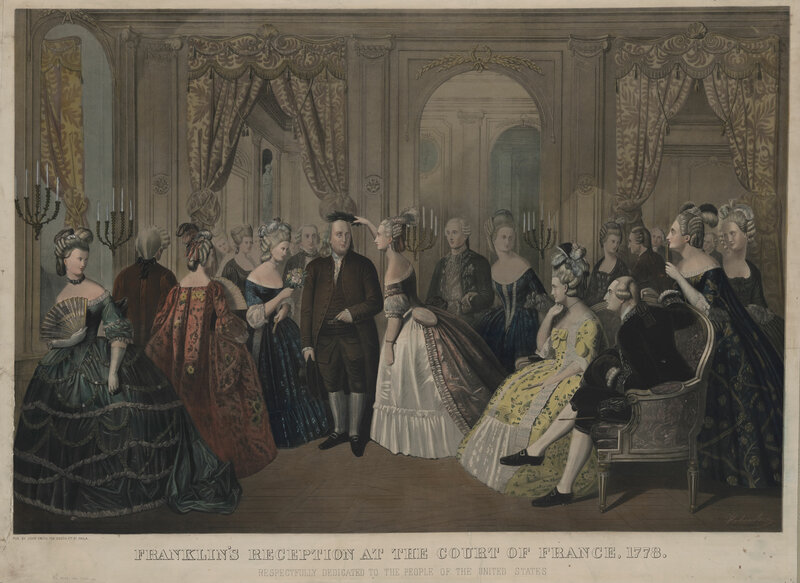 Instead of rejecting Franklin for his rustic presentation amidst the embroidered silks, satins and brocades of the court, French high society went completely gaga for him. He was a huge celebrity, so often depicted in portraits that people all over the country would recognize him and flock to him wherever he went. He was the incarnation of the democratic spirit of the new country, and everyone from King Louis XVI to Queen Marie Antoinette on down thought he was the bees knees. This particular suit looks a very somber brown now, but it was originally a plum or claret color. Still modest and restrained, of course, but not quite as much as his brown homespun he called his “Quaker” suit. The fading of the color is one of the main conservation issues the Smithsonian will have to tackle. Although the structure of the three pieces — breeches, waistcoat and coat — remains sound, as does the linen lining, there are places where the fabric is puckering and flaking. Now that the museum owns the suit outright, it can work on a conservation plan based on their years of research and the latest technologies that will stabilize it to ensure it remains in the American cultural patrimony for centuries to come. 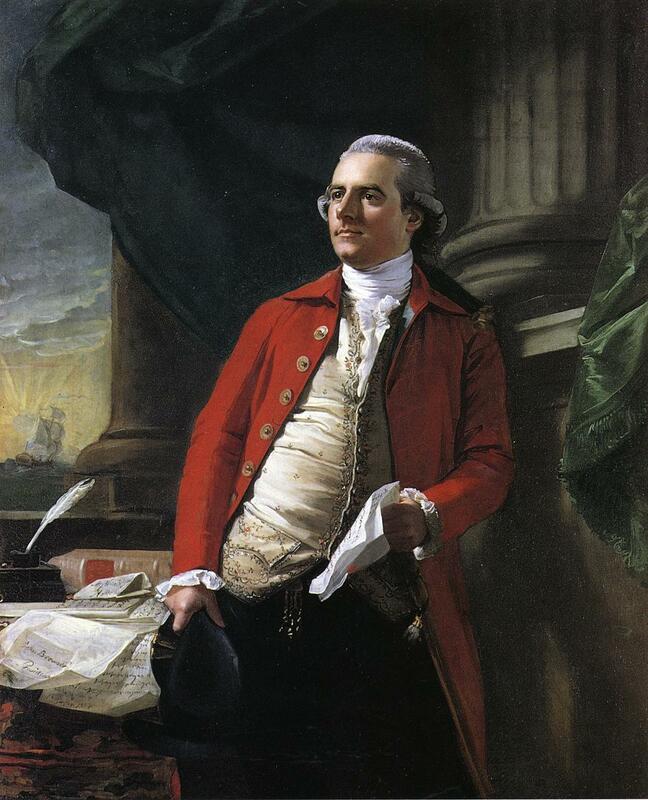 Below is the account in Elkanah Watson’s memoirs of Mrs. Wright’s creation of the wax head of Benjamin Franklin, Franklin’s donation of one of his suits to complete the look, and the later wacky adventures of the suit and the head in France and England. Keep reading for a few pages after the first two because it’s awesome. Watson pulled many a Weekend at Bernie’s with that suit and wax figure, bless his youthful scampery. This entry was posted on Wednesday, August 29th, 2012 at 5:37 AM	and is filed under Modern(ish), Museums. You can follow any responses to this entry through the RSS 2.0 feed. You can skip to the end and leave a response. Pinging is currently not allowed. That is the dapperest of suits if ever a suit is dapper. I would totally watch a National Treasure movie if in the key sequence Nic Cage had to put it on.